We are together here tonight for a special occasion: to practice the dharma. With joyful effort, we are going to dedicate our time and concentration toward the development of inner peace and wisdom for everyone. To begin, we should have the right motivation. This is known as bodhicitta, an attitude of love and compassion for all sentient beings, including oneself. We can understand the value of bodhicitta in a very practical way, through direct perception and our own experience, without having to use deduction or inference. In both worldly life and dharma practice, it is very important to develop an attitude of love and compassion. It brings joy and happiness to everyone. As Mahayana practitioners and followers of the Buddha, we should meditate on bodhicitta all the time. This is our principle practice no matter what other disciplines we perform. All activities must be based on this attitude. Having aroused bodhicitta within our hearts and minds, we should listen to the teachings. Shakyamuni Buddha offered many different levels of instruction in order to help all sentient beings realize enlightenment. Tonight’s teaching is the condensed essence of the Buddhadharma which was revealed by Guru Padmasambhava. Guru Padmasambhava was born about eight years after the Buddha’s mahaparinirvana. Over a thousand years later, in the eighth century, he came to Tibet and performed many miraculous activities for the sake of awakening sentient beings. He didn’t follow conventional rules and regulations but went beyond egoic habit patterns altogether. His activities were an expression of transcendental wisdom and he helped guide many sentient beings toward buddhahood. Guru Padmasambhava predicted that in the future, there would be people who did not believe that he was real or that anyone could do such miraculous things. As a testimony, he left hand prints in the rocks around four different lakes in Tibet which can still be seen. He said, “I have definitely come to Tibet. These are my monuments.” Guru Rinpoche also left four footprints in the four directions, two in Tibet and two elsewhere, south of Tibet. He even left his body print in the mountains of Bhutan, near the Tibetan border. This is not just a story or a myth. You can still go there on pilgrimage and see his whole body impression in solid rock. These are reminders that Guru Padmasambhava actually came into this world and shared his wisdom. There are 1,900 different versions of the life story of Guru Padmasambhava. The most popular one in this country is known as The Life and Liberation of Padmasambhava. It contains about 110 different activities which can be condensed into eleven principal aspects, including accounts of the eight emanations of Guru Padmasambhava. Guru Padmasambhava is a totally enlightened being. He is the supreme embodiment of all buddhas. On the highest level of the dharmakaya, Guru Padmasambhava is known as Samantabhadra or Vajradhara. The sambhogakaya Guru Padmasambhava is known as Vajrasattva, and in nirmanakaya form he is known as Buddha Shakyamuni or Guru Padmasambhava himself. Guru Padmasambhava proclaimed that he is no other than the Trikaya Buddha. He is also known as the Buddha of the degenerate era. His guidance, protection, loving-kindness and wisdom activities are something special to all Tibetans. Guru Padmasambhava’s miraculous bodily aspect was first demonstrated by his manner of coming into the world. He appeared spontaneously in the center of a lotus. Abiding in a rainbow-body, replete with transcendental wisdom, Guru Padmasambhava is also free from aging, sickness and death. These are some of his primary bodily attainments. Guru Padmasambhava’s power of speech was made evident through his discourses on the Vajrayana and inner tantric teachings. This is really his specialty, because he is the Buddha of the degenerate era and the guru for high level practitioners. He is also known as the Buddha of tantra. His speech is very powerful. Merely by hearing his words, even mighty demons are completely subdued. Their minds and attitudes transform into the bodhicitta state of love and compassion. The supreme activity of Guru Padmasambhava’s mind is the realization of transcendental wisdom. He sees everything perfectly in one moment without mixing anything up. Whether an event is in the past, present or future, he is always clear in relation to the phenomena of the three times. All his predictions from the eighth century continue to be amazingly accurate even to the present day, for the world in general, and particularly for the situation in Tibet. This is an example of his wisdom mind. One special quality of his transcendental activity is that Guru Padmasambhava does not just manifest as one buddha. He may seem like that, but he can appear in various ways at once, without being limited to a single embodiment. For example, he manifested as an ordained monk, a yogi and a lay practitioner, all at the same time. Outside of the Nyingma lineage, in the other schools of Tibetan Buddhism, there are many masters who have had visions of Guru Padmasambhava and received teachings which greatly improved their realizations. He appears in many different forms in order to benefit all sentient beings throughout the three times and ten directions. By meditating on Guru Padmasambhava, practitioners remove obscurations, heal disease and sicknesses, pacify mental unrest, resolve psychological and emotional problems, and augment their realization of peace and happiness. Regular practice of guru-yoga overpowers and tames all kinds of wild conceptions and dualistic habitpatterns. It subdues ego-clinging, ignorance, attachment and anger. By practicing on Guru Padmasambhava, we accomplish all four of the enlightened activities. 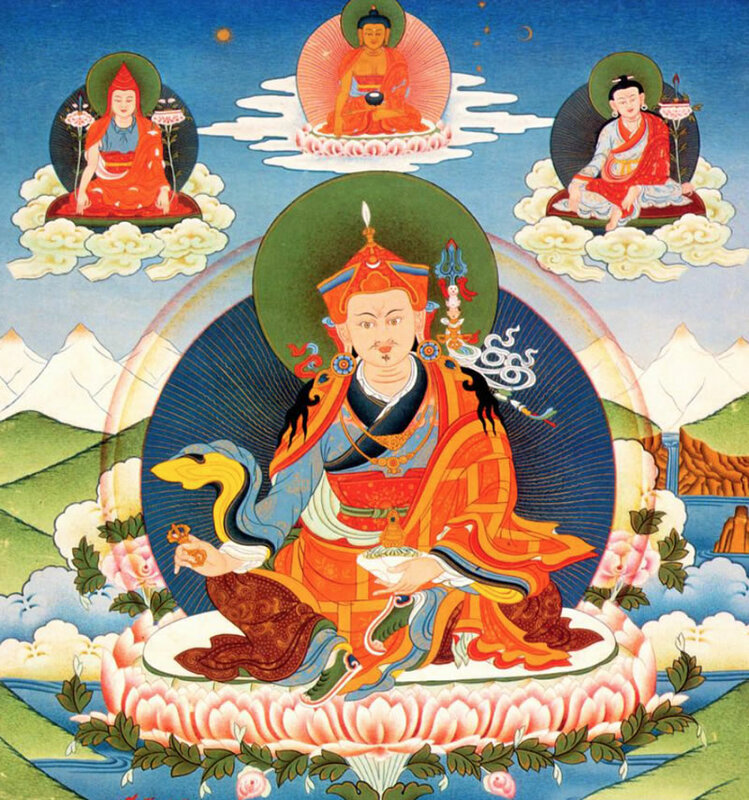 The text for this teaching was originally taught by Guru Padmasambhava. It is a combination of both Sutra and Vajrayana teachings. It is known as the “Lam-rim Rinchen Ph’ung-pa.” Lam-rim indicates that this is a graduated path teaching aimed at a progressive movement toward enlightenment. Rinchen Ph’ung-pa means “Heap of Precious Jewels.” It starts with Sutra topics and explains how to develop to attain the highest realization of Dzogchen. Guru Padmasambhava begins by paying homage to Dorje-sempa or the Buddha Vajrasattva. Dorje-sempa has two aspects: external and internal. We have all seen beautiful portrayals of the external Vajrasattva in thangkas. These depict the relative appearance of Vajrasattva as a sambhogakaya buddha. The inner way of understanding is indicated through looking closely at the terms; dorje in Tibetan and vajra in Sanskrit refer to indestructible wisdom. Sempa or sattva denote compassion. The union of compassion and wisdom is the absolute Vajrasattva and this is none other than one’s own primordial nature of mind. The term “homage” has many different meanings. A realized being is known as an object of homage. Esoterically, paying homage means being in mystical union with the primordial nature. You connect directly with what you are in truth. By invoking and revering that transcendental reality, you merge with it and unite without any separation. This is known as absolute homage. After paying homage to Vajrasattva, Guru Padmasambhava reveals his reasons for giving these particular teachings in one shloka or verse of four lines. I will give you a rough translation. He says that we should observe and think carefully about all forms of knowledge and not restrict ourselves, but to keep our minds open to every aspect of existence. This is an admonition to be impartially aware of everything which surrounds us. When you do that, you will understand how situations develop and learn to recognize how mind and perception coordinate and create our experience of the world. You will discover something mystical about what is happening here. Is your experience really the way it seems? Why is it that way? When you really inquire, you will find amazing answers. One’s mind is the source of everything that is going on. All this motion is known as samsara, and is only within the mind. There is no samsara to be found other than the one within the domain of conceptual and dualistic consciousness. Enlightenment or nirvana is beyond conception, mundane ideas and habit patterns. Click the icon below to download the entire teaching.